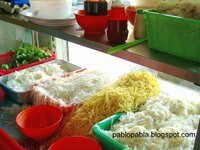 Have you heard of Peter’s Pork Mee in Brickfields, Kuala Lumpur? Let me tell you, my boss swears by it! He has been eating this guy’s pork mee ever since he was a kid staying in Brickfields. Not everyday but at least once a fortnight. He said it was difficult not to think of Peter’s Pork Mee during the cold winter nights in Wales. Such is the power of Peter’s Pork Mee. 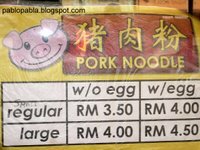 For me, it is also one of the best pork mee I have tried. It will be a shame not to share it with you. Peter’s Pork Mee stall is located in Restoran New Lay Sin along Jalan Tun Sambanthan. Restoran New Lay Sin fronts the traffic light which leads to Jalan Travers. It is a short walking distance from KL Sentral. 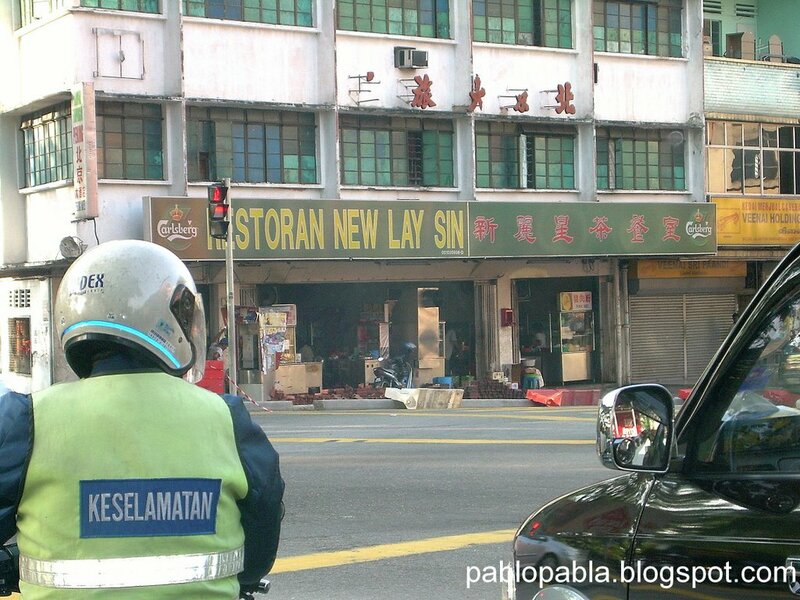 Restoran New Lay Sin has been around for many years and is probably the most famous kopitiam there in Brickfields. Peter’s Pork Mee comes with a choice of yellow noodles, kuey teow, bee hoon (rice vermicelli) and loh shee fun (a type of noodle mad using rice flour which resembles a rat’s tail). You can have your Pork Mee in soup or you can order the dry style where the noodles will be coated with Peter’s special blend of sauce with a bowl of soup to go with it. My favourite is a bowl of Pork Mee in soup using a mixture of yellow noodles and beehoon (also called “maifan mee” in cantonese). Either way, he will crack an egg into the soup to give it a real “kick”! Peter’s Pork Mee is usually served without pig’s liver unless you specifically ask for it. The usual ingredients are a generous amount of minced pork, sliced pork, crispy chinese mustard leaf (sawi / choy sum), tung chai and crunchy pork lard (chee yau char). Birds-eye chilli (cili padi) in light soya sauce will be provided for those who wish to have a fiery experience. The soup is full bodied and is prepared fresh in the mornings before the stall is open for business. For a stall like his, Peter has 2 assistants to help him. That gives you a hint of the popularity of his Pork Mee. It is not uncommon for customers to have to wait up to 30 minutes on weekends during lunch hour when the crowd comes in. Each order is cooked individually. Whilst there are many other stalls in this kopitiam, Peter’s Pork Mee remains one of the main draws to the customers. 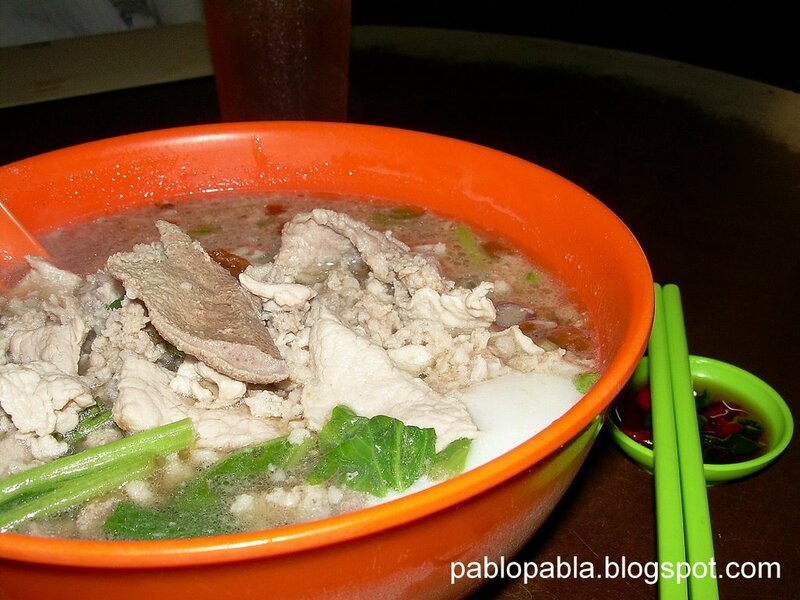 You will see a bowl or two of Pork Mee on each of the tables occupied by customers. Peter has been in this business for many years, starting as an apprentice to the original pork mee vendor. He believes in cooking the noodles himself rather than employing some foreign workers like what some other hawkers are doing. 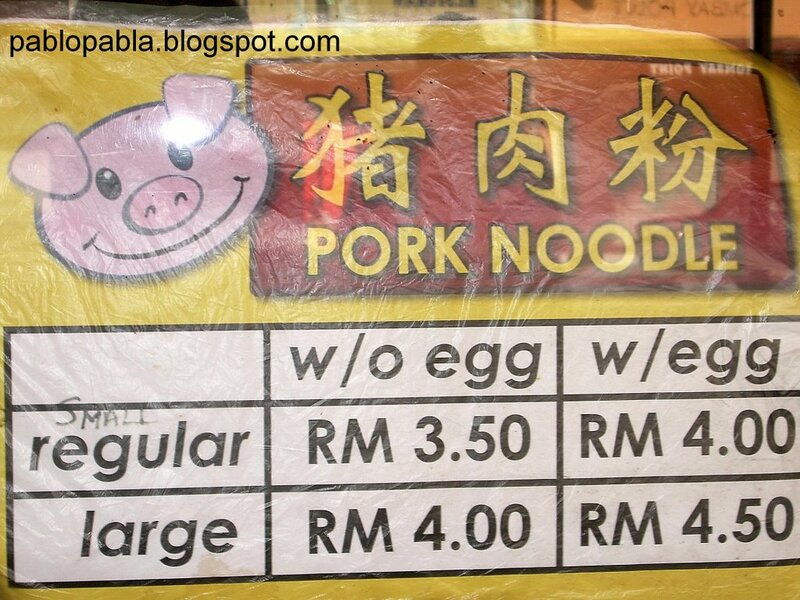 That is his way of preserving the quality of his Pork Mee, which comes in a big portion. Peter’s Pork Mee is reasonably priced and his stall is open everyday from 7.30am till 2.30pm except alternate Tuesdays when the whole kopitiam is closed. conniexan : LOL! Good things must share wan 🙂 I was there this morning for breakfast…with my boss, of course. Anyway, I’ve been to one somewhere in OUG…can’t remember where exactly it is located but it’s packed with people and quite good. A bit different from Peter’s though but equally good on its own. I wonder if it is the same one. But I remember clearly there’s no PDA involved…maybe back then. LOL! kehkehkeh, You kena liao. Fun project, up to you where you want to write la. I used to go there as well, so decided to go check it out again today. Unfortunately, the place is boarded up for some renovations. I eventually found a branch in Yit Sieng Restaurant (corner coffee shop opposite the YMCA in Brickfields. This one is closed on alternate Fridays. There was a notice that mentioned another branch at the Mayflower Moneycorner that closes on alternate Mondays. I don’t knwo where this is. The food is still good but the prices has gone up a bit. Gan : Mayflower Restaurant is located directly opposite Pos Laju along Jalan Tun Sambanthan in Brickfields. You will see an open air car park opposite Pos Laju. The restaurant is located inside. 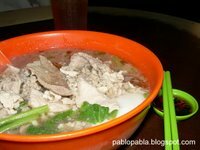 im from singapore and this pork mee is super awesome! been having it for 3 years now! a must visit on my semi annual visits to KL!